Want to get the fuzz off the brains? The answer is to snack exclusively on squirrel food. Cuz look at those guys, WIRED! if they had typewriters they'd make Shakespeare look dumb! If they were sports stars, move over Joe Montana! Rocket scientists, strictly Werner Von Braun levels of super clear, imaginative, space-calculating (See them jump from ONE TREE to the NEXT) high functioning brains! The opposite of Alzheimers and Autism which so afflict our world on incrementally growing levels that cannot be genetic maladies as gene faults stay at the same % rate of population forever. Not those two enviornmental brain maladies! Scientists now link Alzheimers brain dysfunction with Autism, and BOTH WITH HERPES in the AMYLOID Brain PLAQUE. There are nearly 8 million GOOGLE urls that respond to alzheimers + link + autism. Add Search term HERPES, much less research. Read a synthesis THE CAUSES AND CURES of DEMENTIA. and The prevention is don't get HERPES, avoid touching cold sores with hands.......the CURE is raw 'germ of life' as found in seeds, Nuts and the oil of both.i.e. what quick little squirrels eat. We can adapt SQUIRREL non-cookery to our own limited kitchens, abilities and brains with the slightest amount of kitchen preparation. Also, if we're concerned about being more vital, getting moving during a recession to make some extra cash, (Organic candy cookery,) well the addition of SQUIRREL SNACKS to your diet, once a day as sweets, several times as raw salads topped with seeds...that kinda nibbling will light your wick and that of your kids. You lot are going to eat your way LIVELY! And give it to the kids as they'll get clear-headed and stop making bad life choices! The 'duhhhh' me so stupid choices. During the time I lived with CARLITOS, the WONDER SQUIRREL, I learned that even the semi crippled, (which Carlitos was for a while there), is more clever and energetic than any human. I didn't wonder WHY for long. He refused hamburgers, cokes, pancakes, scrambled eggs and made circles around the table for raw NUTS! Go figure! So here are his favorite recipes for you and your family to eat. ANY NUT done as CANDY- (< clickable URL) Throw all the fresh, raw, cold seeds & nuts into blender with a few dried figs, dried cherries, dates, dried cranberries, some coconut, all or any of it, something sweet, dried up, add lemon rind and lemon juice and whirrrrrr. Make balls, wrap on saran, store dry in glass jar in fridge. A few squirrel balls in the post lunch hour with a cup of Colombian coffee. WOW! That'll really LIGHT YOUR WICK! SUNFLOWER & PUMPKIN SEEDS - Shelled kind, from hfs, must be kept ice cold to prevent rancidity. You can toast lightly on heavy skillet, toss into bowl, throw on some good soy sauce, where soy not wheat is first ingredient, stir/shake until it stops sizzling, steaming, of course toasting kills some of the magic power. As I do with popcorn, one can add raw, fresh squeezed garlic. (I add it to the butter.) Or add your fav seasoned salt. Make your own from bulk-bought ingred, real sea salt to get a fantastic flavor. I always put garlic powder, thyme, sage, oregano, a little cumin and curry, onion powder in mine. RAW VEGIES- PTTTOOOEEY! right? But any raw vegie can be made tasty with RANCH DRESSING! Kraft makes a jalapeno cheese ranch dressing a buck a jar, Man, I'd eat any Veg my Mom gave me with that Ranch dressing! But in keeping with our seed theme, just use toasted sesame seeds. Tastiest? The Inside of broccoli stems, PEEL those suckers THEY ARE GOOD! SESAME GOMASIO (toasted seeds as SEASONING)- Heat sesame seeds on heavy skillet til popping, lite gold, then cool slightly. Grind in some sea salt, just a sprinkle! Japanese invented this. Cuts way down on salt use. The little bit of salt you get in there, when ground in, melts over the sesame and is extended. No mortar/pestle or food processor? Use back of spoon to grind it in. Keep gomasio in jar, sealed, dry; keep cold in fridge. Use to make boring foods light up your mouth! On rice, grains, but good on raw vegies. VEGIES THAT RESPOND TO GOMASIO: Use on cuke slices, celery, salad leaves. Before you serve vegies, chop some fine arugula on top. Maybe one or two Kalamta olives. These last two will really amuse the mouth. The important thing is that if you snack on these foods and avoid fried chips, sugary "later-let-down" foods, you will double your body's aura and energy. You will build health with what you snack on instead of the other way around, which most snacks do. FRUIT- Carlitos was encouraged to go run around the garden daily, climb trees. He was inordinately fond of any tree that was hanging with ripe fruit and so was his cousin, Captain Cody Clarke, who'd join him. And they'd chatter away while playing tetherball with ripe apricots. Fruit has to be eaten solo. No vegies or starches with it. Mono-meals of fruit will have you climbing trees, too! 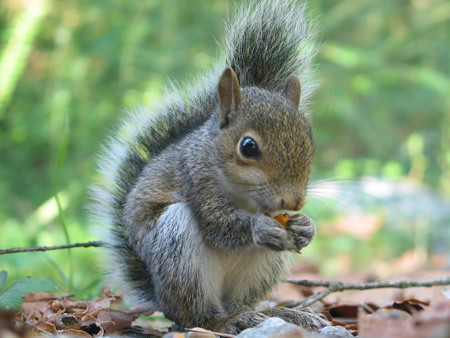 If you find a baby squirrel, fallen from nest, they are MUCH easier to feed, heal, raise than PIDGEONS. Those are HARD. Anita Sands Hernandez a California astrologer, also raises cats. She is found at astrology at earthlink dot net.